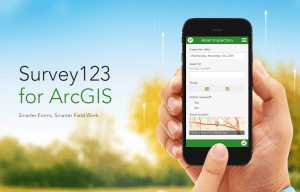 Survey 123 for ArcGIS – What is it? Survey 123 for ArcGIS- What is it? Please join us for this informative one hour webinar! Are you tired of bringing paper forms into the field, then having to input your information once you are back in the office? Come learn about Survey123 for ArcGIS that will help ease your data collection by asking questions, getting answers, and helping you make informed decision. • Esri Apps, Survey123, why use it? • Who is using Survey123?